Learn how to cook healthier on a budget and busy schedule from a professional chef. Use healthy ingredients that are available in your neighborhood corner stores. Have the opportunity to learn about healthy changes you can make at home. 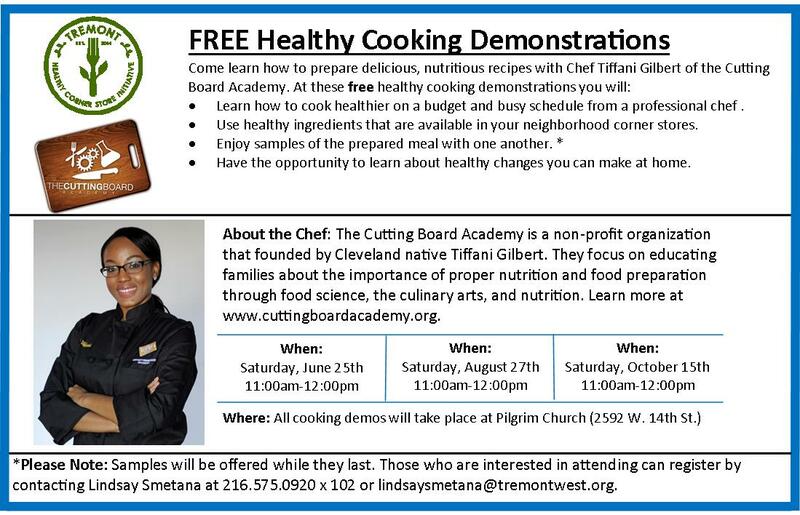 The Cutting Board Academy is a non-profit organization that was founded by Cleveland native Tiffani Gilbert. They focus on educating families about the importance of proper nutrition and food preparation through food science, the culinary arts, and nutrition. Learn more at www.cuttingboardacademy.org. Please Note: Samples will be offered while they last. Those who are interested in attending can register by contacting Lindsay Smetana at 216.575.9020 x102 or lindsaysmetana@tremontwest.org.